“Let’s get spooky, motherfuckers!” is the only way to describe the Joywave and Sir Sly show at House of Blues Chicago on Halloween. 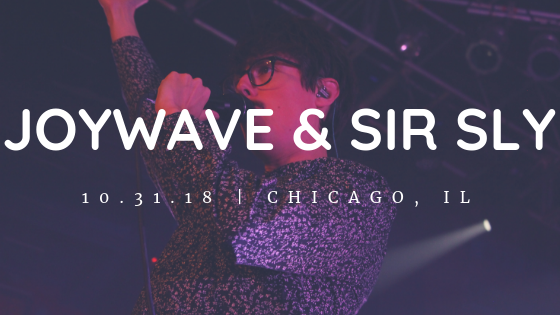 Joywave and Sir Sly present: An Evening with Sir Sly and Joywave was in the midst of their fall tour when they stopped in Chicago on Halloween. There were less tricks and more treats, especially for those who haven’t seen either act live before. Each playing an hour set, complete with on-stage antics and spooky puns, there wasn’t a moment where the crowd wasn’t captivated. Joywave started the night after opening act Flora Cash, letting the curtains open to their dramatically posed stance and beginning with their summer single, “Blastoffff”. Their stage included light boards with phrases like “Applause”, “Talk”, “Intermission” and “Jump”, all of which were incorporated creatively throughout the set. Lead vocalist Daniel Armbruster didn’t slow down for a second, unless the brief intermission counts. His stage presence was loud and his movements flowed with the beats of every song. When he wasn’t bouncing from one side of the stage to the next, he was interacting with the crowd. He would get as close to the end of the stage as his balance allowed, making sure that everyone near the barricade could practically feel the energy radiating off his body. When Sir Sly took the stage, it was a haze of fog mixed with three men adorning head to toe black ensembles. As the smoke cleared during “Welcome the Pressure”, their latest and unreleased track, it was clear to see Landon Jacobs, Jason Suwito and Hayden Coplen were channeling their inner 90s goth for their costumes. This was their biggest headlining show in Chicago to date, which Jacobs pointed out in between songs. In honor of that, they gave the audience the option to select how they wanted part of the setlist to go. “Choose your own adventure” as Jacobs called it, referring to the popular children’s book series where the reader gets to choose the plot’s outcome. Did they want his typical talking points of how the band started followed by a sad song, or did they want to continue with another song that better fits the Halloween vibes of the show? They closed out the show with not one but two performances of “High”, refusing to let the energy from the first performance dwindle, and crowd favorite, “&Run”. Joywave and Sir Sly are two bands that have created fan bases based on their interstellar live performances, and this show was no exception. For the 364 days that they don’t grace a stage in devil onesies or black lipstick, Chicago got a real treat with a one-of-a-kind show. No tricks necessary. See photos of the show here.